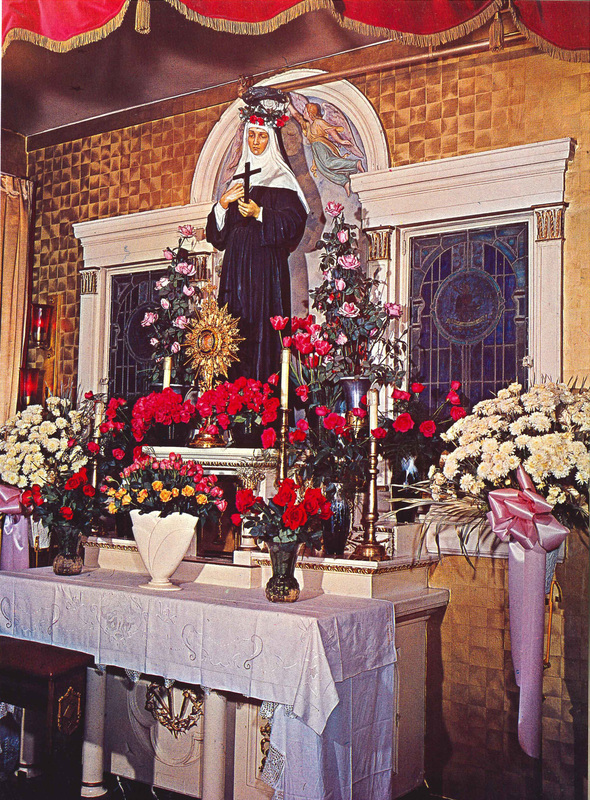 In the year of Our Lord 2000, on the 100th anniversary of the canonization of St. Rita, the present St. Rita of Cascia Shrine Chapel was beautifully renovated. This renovation included the construction of the present Shrine prayer space and the visualization of the life story of St. Rita of Cascia through hanging banners. The lovely sanctuary was also completely redecorated at this time. The renovation was designed and carried out by Unreal of 3514 West 111th Street, Chicago. The Shrine prayer space reincorporates key artifacts from the original Shrine on 63rd Street. The reliquary containing the first class relic of St. Rita dates back to 1906. The statue of St. Rita dates back to 1909 and was one of the first statues with glass eyes to give the statue a realistic appearance. The stained glass windows that now flank the statue of St. Rita depict the thorns and roses of St. Rita, and the Official Seal of the Augustinian Order, both of which date back to 1932. The hanging banners visually tell the life story of St. Rita of Cascia. Her life journey mirrors our life journey from baptism to eternal life with God. Upon entering the center doors of the Shrine Chapel, we bless ourselves with the holy water that reminds us of our baptism. Following the progression of the banners, beginning with the left banner, we see the baptismal name of Rita with a rose that has come to symbolize her life. Her journey continues to the right banner depicting her sacramental vocation as wife. The wedding rings depicted are designed after her actual wedding ring, which is on display in the Monastery in Cascia, Italy. To the left we now see her vocation as mother with the two roses representing her two beloved sons. Moving again to the right, we encounter her widowhood and the tears that were shed from a sorrowful and mournful heart. Then again to the left, we see the Official Seal of the Augustinian Order depicting Rita’s final vocation as an Augustinian Cloistered Nun. The last banner to the right depicts a dove representing peace and the fact that Rita’s life was devoted to being a peacemaker in her family, her community and to all she encountered. This final banner hung within the sanctuary completes Rita’s lifelong journey on earth to her eternal reward in heaven. These beautiful banners depict the life journey of St. Rita from baptism to eternal life. As we reflect on her life journey, we are called to reflect on our own life journey from baptism, through life, to eternal life with God. On April 15, 2007 the St. Rita Monastery Community hosted a dedication mass to celebrate and bless the nine shrines that are present along the chapel walls. The celebration was amazing. The event unveiled the beauty of seven mosaics and two sculptures while truly capturing the importance of intercession through the saints. The dedication was celebrated by Bishop John Michael Botean, the Romanian Catholic Bishop of the United States and friend of the Augustinians. Bishop John Michael blessed each shrine individually by anointing the image with Holy Chrism, a magnificent and elaborate blessing unlike many of us attending has ever seen before. The celebration concluded with a gathering of all present, in the dining hall for breakfast. The nine shrines depict the images of St. Patrick, St. Francis Xavier Cabrini, Pope John Paul II and Blessed Mother Teresa of Calcutta, St. Therese of Lisieux, St. Teresa Benedicta of the Cross, St. Monica, St. Martin de Porres, Our Mother of Good Counsel, and Our Lady Of Czestochowa. Each shrine was donated, and each donor chose saints, and images that have special meaning in their hearts but also represent the different facets of St. Rita High School and our faith community. The bottom of each mosaic and sculpture is an engraved biography of the person. Under the art design direction of Mr. Jim Rouen of Un-Real, Inc. in Chicago, the nine shrines are a collection of Byzantine mosaics, made with hand-cut Italian glass, by artist Mr. Joe Folise of Morton Grove, along with sculpture and mosaics by Daprato Rigali Studios and Evan Lewis Studios, both of Chicago, and a glass statue imported from Italy. St. Rita Chapel has always been the national Shrine of the Midwest devoted to the veneration of our patroness, St. Rita. 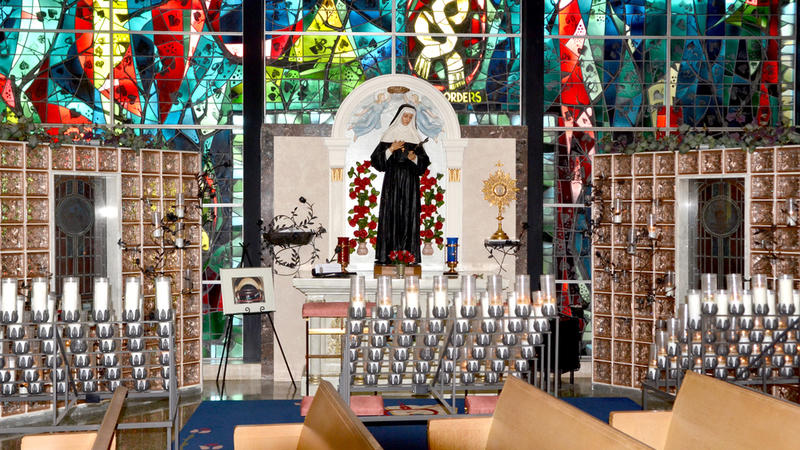 Now, our Chapel is a place for your spiritual pilgrimage to reflect upon the lives of St. Rita, along with many other saints. Let us continue to pray for their intercession and look at their lives for guidance in our own. Bishop Gustavo Garcia-Siller, M.Sp.S., former Auxiliary Bishop of Chicago, celebrated a special all-school Mass at St. Rita of Cascia High School on December 12, 2007, the feast day of Our Lady of Guadalupe. After a moving homily that evoked the origin and meaning of the Mexican people’s devotion to Our Lady of Guadalupe, he dedicated and blessed three new shrines for the St. Rita Shrine Chapel. The first was the Our Lady of Guadalupe Shrine, with a beautiful and authentic recreation of the image stored in Mexico, donated by Bishop Gustavo himself. The shrine was also funded by a donation from Mr. Anthony Spalla and family. The second shrine dedicated was that of St. Augustine, donated by Mrs. Jane Nedvar. The third shrine was the Augustinian Tree of Life, which is a gorgeously shaped installation over the main chapel doors, with the leaves bearing the names of all the Augustinian Blessed and Saints. A plaque listing all of the donors and family members honored through the shrine will be completed once the list is finalized. Joe Folise, who created the nine shrine mosaics, also oversaw the construction of the Tree of Life. Together, the two installations have reignited the fire and beauty of St. Rita’s Chapel Shrine, and they have encouraged many visitors from the community to attend the Perpetual Novena to St. Rita of Cascia, held monthly the first Thursday evening at 7:00 p.m. All are invited to attend the Novena and witness these beautiful testaments to faith. The St. Rita High School and Monastery Communities thank all those who have and will continue to support the Shrine Chapel and the new shrines. For information about booking the Shrine Chapel, contact Josh Blaszak '02, Shrine Chapel Associate Director 773-925-6600 ext. 6626 or [email protected].